Carbon monosulfide is a chemical compound with the formula CS. 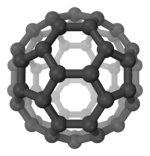 This diatomic molecule is the sulfur analogue of carbon monoxide, and is unstable as a solid or a liquid, but it has been observed as a gas both in the laboratory and in the interstellar medium. The molecule resembles carbon monoxide with a triple bond between carbon and sulfur. The molecule is not intrinsically unstable, but it tends to polymerize. This tendency reflects the greater stability of C-S single bonds. Polymers with the formula (CS)n have been reported. Also, CS has been observed as a ligand in certain transition metal complexes. ↑ Wilson, R. W.; Penzias, A. A.; Wannier, P. G.; Linke, R. A. (1976). "Isotopic abundances in interstellar carbon monosulfide" (pdf). Astrophysical Journal. 204 (pt 2): L135–L137. Bibcode:1976ApJ...204L.135W. doi:10.1086/182072. ↑ Chou, J.-H.; Rauchfuss, T. B. (1997). "Solvatothermal Routes to Poly(Carbon Monosulfide)s Using Kinetically Stabilized Precursors" (pdf). Journal of the American Chemical Society. 119 (19): 4537–4538. doi:10.1021/ja970042w.